Discover the many causes you and your fellow travelers have supported through ResorTime. “Have courage and be kind. For where there is kindness there is goodness, and where there is goodness there is magic.” This quote, taken from the childhood fairytale Cinderella, seems far-fetched, unlikely, and implausible. Yet at Hunkapi Programs, we work to rekindle “magic” on a daily basis. Hunkapi Programs, Inc., is a therapeutic riding stable serving individuals with emotional, behavioral, psychiatric and developmental disorders. The majority of the program’s clients are on the Autism Spectrum, with increasing populations from situations of abuse, trauma, or addiction. The program uses equine-based therapies to connect and communicate with individuals from varying backgrounds, basing its methods in research. Alex, a competitive tri-athlete suffered cardiac arrest crossing a race finishing line two years ago. Dead, revived, and in a coma for 3 months, today Alex struggles with anoxic brain injury. At the age of 30, he finds himself fully dependent on his parents. Alex’s mother is tireless, yet exhausted. She’s stressed out, anxious about her son’s future. She feels isolated, alone, and judged by Alex’s appearance, and his behaviors, much like the parents of many of our other riders with diagnoses of Asperger’s, Autism, ADD/ADHD, OCD, Downs Syndrome, Cerebral Palsy, Depression, Anxiety Disorders, and much, much more. When Alex comes to Hunkapi, he is transferred to the top of a horse, where Alex is king of the world, in control, and able to clearly dictate his wishes and desires. On top of his horse, Alex is free. Have courage. It takes courage to ask for help, to bring a child to therapy, to approach a thousand pound animal, and to put your life into the hands of strangers. It takes courage to delve back in time, and approach repressed memories. It takes courage for the child with Autism to attempt to communicate their needs and desires with those around them. Be kind. We don’t always realize the effects that our words have on one-another, and aren’t always attuned to our own body language. With horses, that’s not an option. Horses have the innate ability to tell your story without words; fake it to make it is just not going to cut it. Horses move, communicate, and trust based on kindness, and expect the same of their riders. For where there is kindness there is goodness, and where there is goodness there is magic. It’s the moment you see the grin of a hearing-impaired child realizing that they don’t need words to communicate- that their horse hears and comprehends their directives loud and clear. It’s the moment you give legs to the veteran who fought hard and gave up everything, allowing him to move with four legs instead of his own two. It’s the moment a blind individual is offered the chance to steer on his or her own. It’s the moment the nonverbal child utters their first sentence. It’s the moment the mother of the child begins to silently weep, as she sees her child, suffering of depression, choose to interact with the world once more. These are the moments we live for- the moments in which we are reminded that there is indeed just a little magic to be found in such a vast, busy world. You see, at Hunkapi, we work to foster this “magic,” reveling and losing ourselves in the magic of the exceptional individuals we have the opportunity to spend time with. For it is these individuals who remind us daily of WHY there is magic in the world. In 2006, I heard the words “You have cancer.” I had no idea what lay ahead except that I knew the “C” word was not good. I underwent surgery, chemotherapy, and radiation for nine months. I was unprepared and suffered through the many side effects of treatment. Few roadmaps exist to help cancer patients. Even fewer resources are available to help patients find a new normal after treatment. I was told to go and “live my life” after being pumped full of chemotherapy agents and targeted with radiation. In addition, I was instructed to lose the 60 pounds of weight I had gained from treatment, not to lift too much weight at the risk of lymphedema in my arm, and change my diet. I felt like I was on my own, and many other cancer patients do, too. What if instead of confusion and isolation, survivors felt supported, guided, and encouraged, knowing that this is not the end but the beginning of a new life full of health and vitality? That’s what I wanted during and after treatment, and it’s the reason I started Pacific Cancer Fitness – to provide community, fitness, and wellness education to cancer patients and survivors. In 2010, I became certified by the American College of Sports Medicine as a Certified Cancer Exercise Trainer and began helping patients through exercise classes and support groups. Before long, physicians started referring their patients to me and a vibrant community of survivors took shape. Some, who were once clients, are now training others to embrace fitness and adopt a healthy lifestyle as a way to fight cancer. Pacific Cancer Fitness is here to help survivors navigate cancer treatment and life in remission. Our group fitness classes, integrative education, and comprehensive wellness programs give them the knowledge and skills to make a wise decision about their health and the support they need to reach their fitness goals. Cancer treatment is harsh and results in numerous health challenges. Exercise, however, improves and even resolves many of the complications of treatment such as weight gain, limited range of motion, fatigue, and loss of balance. Pacific Cancer Fitness offers exercise, education and support classes each week that provide an integrated approach to fitness and cancer survivorship. Our Success in Survivorship class uses group exercise, gentle yoga and dance classes to help improve the physical energy and strength of our clients. Cancer Connection is our support group where the emotional challenges that accompany cancer treatment are addressed. This community of cancer survivors encourages each other through their various stages of recovery. Our desire is to provide a safe place for cancer patients and survivors to get healthy with people who have been through cancer and understand their special needs. Please join us or support our work of fighting cancer with fitness. 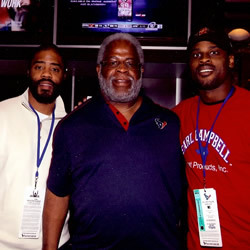 Tyler’s relationship with his Father, Earl Campbell, was strengthened due to MS. They worked together to overcome their medical challenges. They participated in joint physical therapy sessions and Tyler was able to empathize with the physical struggles his Father battled since retiring from the NFL. They share a unique and special bond and inspire each other daily. Being diagnosed with Multiple Sclerosis changed the path of Tyler’s life dramatically. “I’m able to reach more people than I ever could have while running down the field with a football. That’s why I say my disease is a blessing.” As an Ambassador for the National MS Society, Tyler passionately spreads his message of hope. Tyler has worked hand in hand with Pro Player Foundation as a Host for Annual Flavors of Austin and Flavors of the Gaslamp events that shine a light on Multiple Sclerosis.